In Haiti`s city-without-a-government, residents want land titles, taxation. Without titles, residents risk losing any investment they make and cannot use their property as collateral. CANAAN, Haiti—On a street of rocks and white dust in the centre of one of the world`s newest cities, Alisma Robert pointed to an array of electric cabling strung between rickety wooden poles. It wasn`t EDH that built that pole, said Robert, referring to Haiti`s national electricity provider. I`m a citizen - but not for the moment. I don`t have the benefits of a citizen. We don`t have drinkable water ... No public toilets. The government doesn`t do anything for the people who live here. I don`t have work, said the 52-year-old former teacher. However, Voltaire personally believes the land does now belong to the state, so it should be able to do a cadaster there and give land title. That has not happened. After I have my document, I can invest here, Robert said. I could do anything I want - sell food, sell phone credit. Start a hardware store. But no one is legalised here. This is a very delicate situation where the government has not yet compensated or officially identified owners. There`s a lot that needs to be put in order to make this viable, he said. It`s our land. We`ve lived on it - for more than eight years. But we have no papers. If we die, there`s nothing to say our children get to have this, said resident Etienne Manoly. We have many needs from the central state, said Manoly. Yet it remains to be seen whether municipal authorities will allocate money from their budgets to survey the rest of Canaan`s structures - although a representative from the nearby city of Croix-des-Bouquets said it had begun doing so. Between 2013 and 2018, USAID - through its LOKAL+ programme - helped nine Haitian municipalities boost their tax take by 17 percent on average. One of those was Port-au-Prince`s Delmas district, which expanded its tax base: it has since rebuilt roads and pavements destroyed in the quake. Now all those roads are paved, said Anna Konotchick, the former programme manager for Canaan for the ARC, one of the leading NGOs working there after the earthquake. But recognising people`s properties in order to tax them is not the same as granting permanent deeds that would legally secure their tenure, said Jadotte. Tax-related documents might just state that the municipality recognises the person is occupying that place and has built a certain structure on it, and that they are paying their fair share in the form of government taxes or fees,, he said. Even if USAID did fund a LOKAL+ project in Canaan, he said, its residents might still be seen as illegal squatters in the government`s eyes until it decided to address the underlying issue of ownership. Land rights are not a black and white thing - it`s a continuum. And you can move it from uncertainty toward security - papers that say you`re the full owner. And at least one institution does not like the idea of USAID being involved: Haiti`s inter-ministerial land office, CIAT. For the U.S. government to take part in a programme to tax Haitian citizens was against democracy, said CIAT head Michele Oriol. And, she insisted, Haiti`s institutions were up to the task. But we have to do it systematically. But they don`t find - there is no more space. One family asked to buy the 10-by-15-foot patch of front yard that is covered with rocks to lay the foundation for a second home to house some of his eight children. He told them no, because I have kids and they will need it. Canaan cannot become a desert, Robert said, in reference to the state`s lack of involvement. The history of the people of Israel - Moses led them through the desert. He took them out of slavery, he said. It`s the same for me - it`s from slavery that I left, he said, referring to landlords to whom he was indebted in Port-au-Prince before the earthquake. 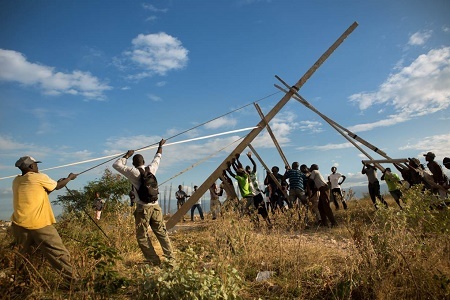 Photo: Residents involved with the community group Organisation pour le Developpement de Canaan (OPDC) raise the first of three light poles they have constructed by way of social production of habitat in the Canaan I neighborhood of greater Canaan, 7 January 2019. Source: Allison Shelley/Thomson Reuters Foundation.